When it comes to rock music, there are two types of listeners: those who love Elvis and those who love The Beatles. Consequently, in the realm of science fiction film, there are two basic types of audience: those who love the Star Wars films and those who love Star Trek. I happen to be one of the latter type. In this offering, Commander Data seems to suffer from a general malfunction which causes him to reveal his presence to the Ba’ku, the populus of a planet that the Federation is monitoring in secret. He breaks the Federation’s Prime Directive, which is specifically set up in the strictest of terms to prevent interference with the natural growth of a planet’s lifeforms. In other words, those who are pre-warp capability in their scientific advancement are not to be helped in their quest for the stars. Captain Picard arrives with his crew to examine Data and to find out why he malfunctioned. It turns out that Data had experienced an event which caused his logic circuits to malfunction. He had discovered the true reason that the planet was under surveillance by the Federation and another contingency, the So’na. It turns out that the Federation is helping the So’na to secretly remove the Ba’ku from the planet so that it can be inhabited instead by the So’na. Picard is given strict orders by the commanding admiral to comply with the So’na and proceed with the plan, but Picard instead takes the Ba’ku away from their village so that they may hide in the mountains. The ensuing battle between the So’na and Ba’ku and its outcome will decide Picard’s fate in the Federation fleet. The effects were, as usual, spectacular. The folks who did the special effects and computer animation for these Star Trek films are extremely skilled and excel in making the effects look real. However, the story falls a little flat by Star Trek standards. Although it follows the formula of bringing the protagonist to the brink of destruction, with no apparent way out, and turning the tables at the end with some mental end-run, I couldn’t help but feel that it was merely an extended episode of Star Trek: Next Generation. 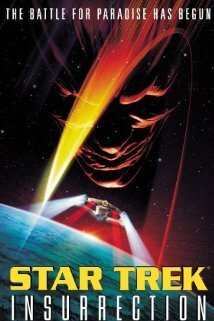 The difference in the first six Star Trek films and the following few, is that there was a ten year absence between the last TV episode and the next Star Trek movie, while the Next Generation cast had barely finished the cake from their wrap party before Generations was released in the theaters. Plus, without the driving influence of creator Gene Roddenberry, the stories in the films were becoming mundane. I enjoyed First Contact immensely, but was a little disappointed in the rudimentary storyline of Insurrection.